Chlorinated lime is a chemical compound that is used as a bleaching and disinfecting agent. It is generally in the form of a white powder. Chlorinated Lime Poisoning is the accidental or intentional intake (swallowing, breathing-in, or skin contact) of any product containing the compound. What is Chlorinated Lime Poisoning? What are the Causes of Chlorinated Lime Poisoning? What are the Signs and Symptoms of Chlorinated Lime Poisoning? The signs and symptoms of Chlorinated Lime Poisoning can vary from one individual to another. It may be mild in some and severe in others. Several systems of the body, such as the vascular system, digestive system, respiratory system, skin and ENT may be affected. How is First Aid administered for Chlorinated Lime Poisoning? Who should administer First Aid for Chlorinated Lime Poisoning? 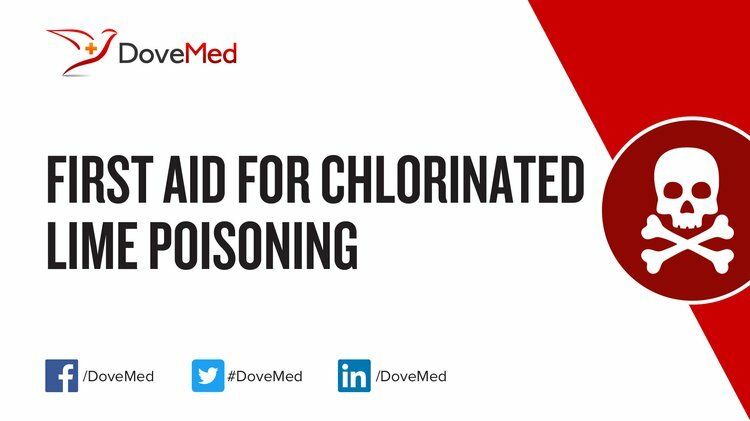 First aid for Chlorinated Lime Poisoning is administered by healthcare professionals. What is the Prognosis of Chlorinated Lime Poisoning? How can Chlorinated Lime Poisoning be Prevented? Asif, M. (2012). Physico-chemical properties and toxic effect of fruit-ripening agent calcium carbide. Annals of tropical medicine and public health, 5(3), 150. Bhattacharjee, G. A. R. G. I., Neogi, S., & Das, S. K. (2010). CHLORINE LEAKAGE FROM THE BOTTOM OF A BABY CHLORINE CYLINDER- HUMAN FACTOR AND LESSON LEARNED. Safety Science Monitor, 14(2), 1-8. Yang, M., & Zhang, X. (2013). Comparative developmental toxicity of new aromatic halogenated DBPs in a chlorinated saline sewage effluent to the marine polychaete Platynereis dumerilii. Environmental science & technology, 47(19), 10868-10876. Club, O. M. S., Kendall, K., Bleach, C., Acid, M., Neutralizer, S. S. L. S. C., Ash, S. C. L. S. S., ... & pH Indicator Solution Phenol Red, R. (2013). Material safety data sheets. Hanna, S., Chang, J., & Huq, P. (2016). Observed chlorine concentrations during Jack Rabbit I and Lyme Bay field experiments. Atmospheric Environment, 125, 252-256. MC USAR, J. A. C., & MC USAR, W. T. B. (2012). Chemical terrorism for the intensivist. Military medicine, 177(5), 495. Jianfeng, L., Bin, Z., & Wenmao, L. (2011). A typical small-scale chlorine leak and dispersion simulation in industrial facilities. International Journal of Energy and Environment, 2(6), 1039-1052. Sharma, G. S. Safety in Laboratories. Recent advances in analytical technigues and innovative approaches for guality assurance and safety of dairy foods, 179.